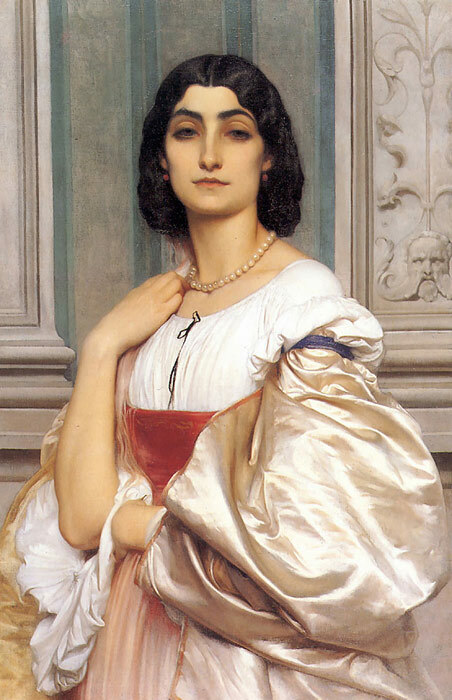 Leighton regarded himself as a very different school to that of the Pre-Raphaelites, yet was friends with many of them, and you can see many links between his Classicism and their style. His intensive early training and study on the Continent always gave to his painting portraits a highly professional and competent quality- A Roman Lady, Phoebe, Biondina etc. His interest in the detailed depiction of soft drapery as it covers the human form shows his knowledge of classical sculpture. In later life Leighton executed some sculpture himself, and was tremendously influential in raising the profile of sculpture in establishment circles. SPECIAL NOTE : The painter will make the reproduction as close to the original oil painting as possible. If you want your painting to alter from this likeness, please email us and " A Roman Lady, 1858-1859 " will be reproduced according to your special requirements.